There are 22 Assisted Living Facilities in the Kenosha area, with 13 in Kenosha and 9 nearby. The average cost of assisted living in Kenosha is $3,633 per month. This is higher than the national median of $3,346. To help you with your search, browse the 112 reviews below for assisted living facilities in Kenosha. On average, consumers rate assisted living in Kenosha 4.2 out of 5 stars. Better rated regions include Pleasant Prairie with an average rating of 4.9 out of 5 stars. Caring.com has helped thousands of families find high-quality senior care. To speak with one of our Family Advisors about assisted living options and costs in Kenosha, call (855) 863-8283. Kenosha, Wisconsin is the fourth-largest city in the state and is located on the southwestern shore of Lake Michigan. In the early 1900s, this area was home to numerous Italian, Irish, Polish, and German immigrants, creating a rich melting-pot culture that can be enjoyed by seniors today. In Kenosha, seniors can choose from 13 assisted living facilities within the city limits and 13 a little farther away. 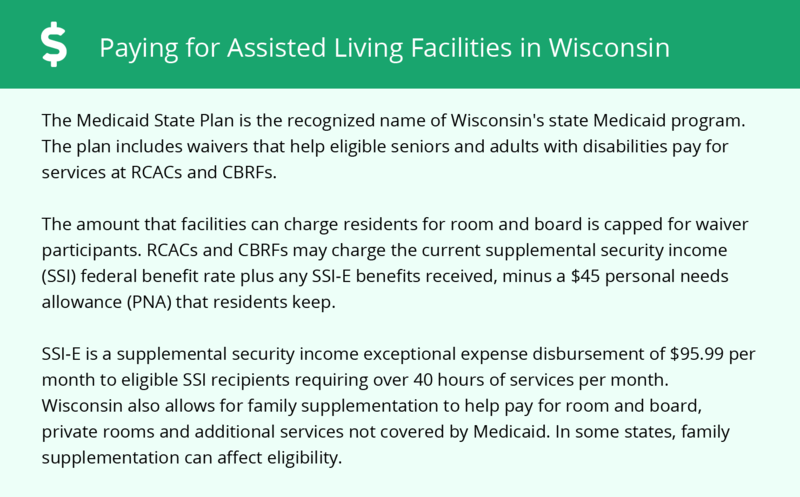 In the state of Wisconsin, there are four types of assisted living facilities (ALF) and programs, namely adult day care, adult family homes, community-based residential facilities and residential care apartment complexes. The Wisconsin Department of Health Services oversees licensure and regulation of ALFs. The Kenosha area is home to world-class medical facilities, including Froedtert South Kenosha Medical Center and the Aurora Medical Center, in the event of medical emergencies or illness. Kenosha has its own bus network, Kenosha Area Transit. Seniors receive half-off daily fares and monthly passes. Because Kenosha is the only city with a Metra station in Wisconsin, seniors can take a direct commuter railroad to Chicago (also for a free or reduced fare, depending on income). Kenosha has an array of community resources for seniors, including the Kenosha Senior Center, an organization that provides exercise classes, dancing lessons and book discussions. The climate in Kenosha is dry and cold, similar to the rest of Wisconsin. With average July highs of 80 degrees and typical January lows of 15 degrees, Kenosha experiences freezing winters and a below-average number of sunny days. Seniors who enjoy warm weather might consider looking for an ALF outside of the Kenosha area. Kenosha is judged to be more dangerous than 77 percent of all U.S. cities. Seniors have a one in 38 chance of being a victim of violent or property crime in this area. The air quality in Kenosha is given a score of 64 based on the number of harmful air pollutants. To put this in perspective, the national average air quality is scored at 58. Because the air quality is better in Kenosha than the U.S. mean, seniors who like to spend time outside could examine this area. Assisted Living costs in Kenosha start around $3,633 per month on average, while the nationwide average cost of assisted living is $4,000 per month, according to the latest figures from Genworth’s Cost of Care Survey. It’s important to note that assisted living rates in Kenosha and the surrounding suburbs can vary widely based on factors such as location, the level of care needed, apartment size and the types of amenities offered at each community. 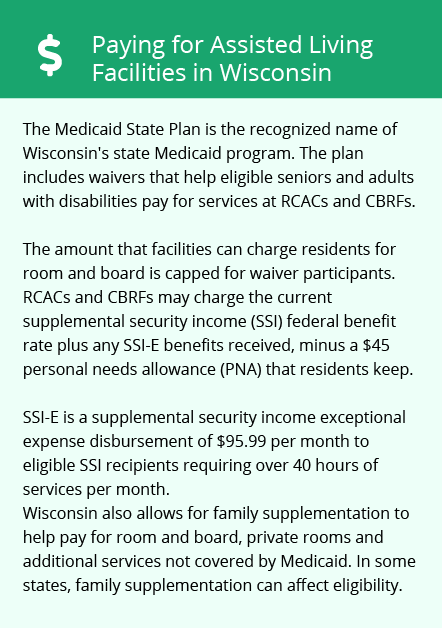 Qualifying seniors can receive additional Social Security income to pay for assisted living through Wisconsin's Exceptional Expense Supplement for Members of Supplemental Security Income (SSI) program. Additionally, Medicaid's Medical Assistance Personal Care program is available to seniors residing in ALFs with less than 20 residents. Kenosha and the surrounding area are home to numerous government agencies and non-profit organizations offering help for seniors searching for or currently residing in an assisted living community. These organizations can also provide assistance in a number of other eldercare services such as geriatric care management, elder law advice, estate planning, finding home care and health and wellness programs. To see a list of free assisted living resources in Kenosha, please visit our Assisted Living in Wisconsin page. Kenosha-area assisted living communities must adhere to the comprehensive set of state laws and regulations that all assisted living communities in Wisconsin are required to follow. Visit our Assisted Living in Wisconsin page for more information about these laws.